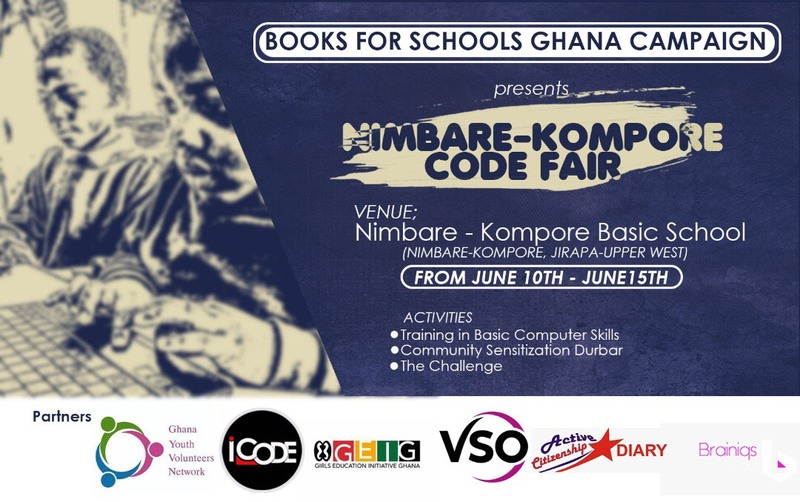 The Girls Education Initiative of Ghana, GEIG is partnering with the Books for Schools Project to implement the Nimbare Kompore Code Fair. GEIG celebrated its fourth anniversary in 2018. Under the theme of #connectedcommunities GEIG set out to focus on extending activities and programs to populations outside of the Greater Accra and Ashanti regions where the primary focus has been in the past. The Greater Accra team has taken on the task of implementing STEAM focused activities; since the start of the 2018/2019 school year workshops have been extended to students at the University Staff Basic and La Bawleshie junior high schools as well as primary students in Abelenkpe. With the momentum of these activities GEIG in partnership with Brainiqs Labs, the two organization welcomed the partnership opportunity from the Books for Schools Project. Under the leadership of Elizabeth Patterson (GEIG) and Emmanuel Opare (Books for Schools), two alumni of Future of Ghana Top 30 Under 30, the two organizations join forces with a common mission and vision to provide quality and inclusive education(al) opportunities for students and schools in Ghana. The Nimbare Kompore Code Fair will equip students of the Nimbare-Kompare primary school with basic computer and digital literacy. Both teams will lead sessions on topics such as Internet safety, web design, and mobile applications to name a few. The long term goal of the week is to instill a passion for technology and the use of technology to solve problems.